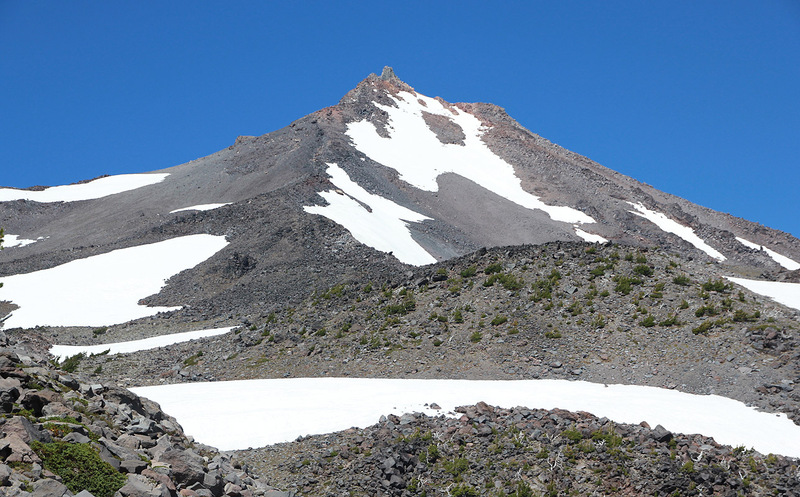 Mount Jefferson is a big and pretty isolated peak, the 2nd highest in Oregon. A good point of reference is the city of Portland. Travel south on Interstate 5 to Salem and locate Hwy. 22 heading east from there. Head east on Hwy. 22 for about 52 miles and locate the small village of Detroit right next to the (dammed) lake Detroit. Detroit has a nice motel, a grocery store and an interesting restaurant with a large pub featuring chainsaws (with super-long swords) hanging under the ceiling. This is a logging town and it shows. The restaurant has a sign saying: "Around here, Normal is a setting on your dryer". 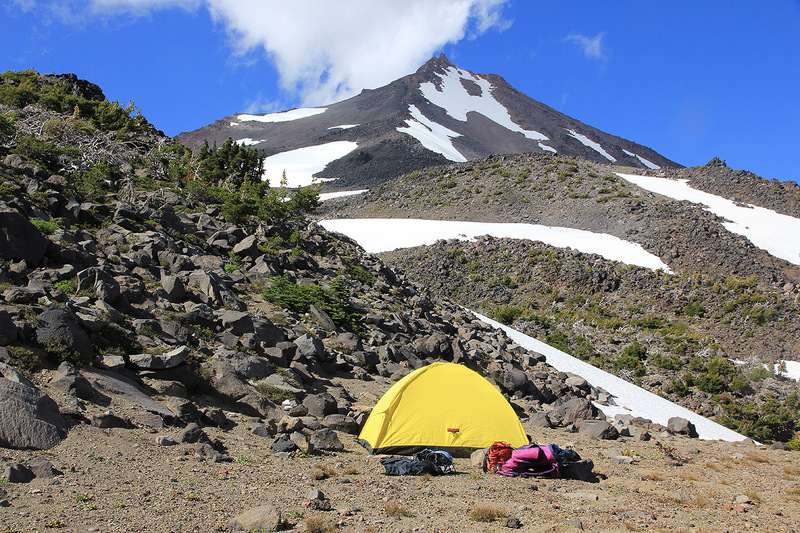 Note: The normal trailhead for Mount Jefferson is the Pamelia lake trail. However, there is a maximum quota of 20 hikers going that way and people may reserve in advance. When we were there (without any reservation), this approach was fully booked for several days to come. It does not matter that you intend to walk through and not stop or camp near Pamelia lake. Fortunately, there is an alternative trailhead that is still of similar effort. This is Woodpecker trailhead that will be described in this report. Woodpecker trailhead: Measure from the corner with the small grocery store (second exit to Detroit). Continue 11.6 miles along Hwy. 22. Just after you pass the (white) milestone 61, turn left on forest road 40. This is a good dirt road suitable for ordinary cars. Go straight at mile 16.2 and park at the obvious trailhead at mile 17. (the road continues, but there is a large sign) This is the Woodpecker trailhead, location N44:40.836, W121:53.115, elevation 1346 meter. The Pamelia trailhead is accessed by turning left from Hwy. 22 onto forest road 2246, approximately 640 meter (0.4 miles) further along. Approach:From the (Woodpecker) trailhead, proceed uphill along the trail that starts right next to the trailhead registration sign. 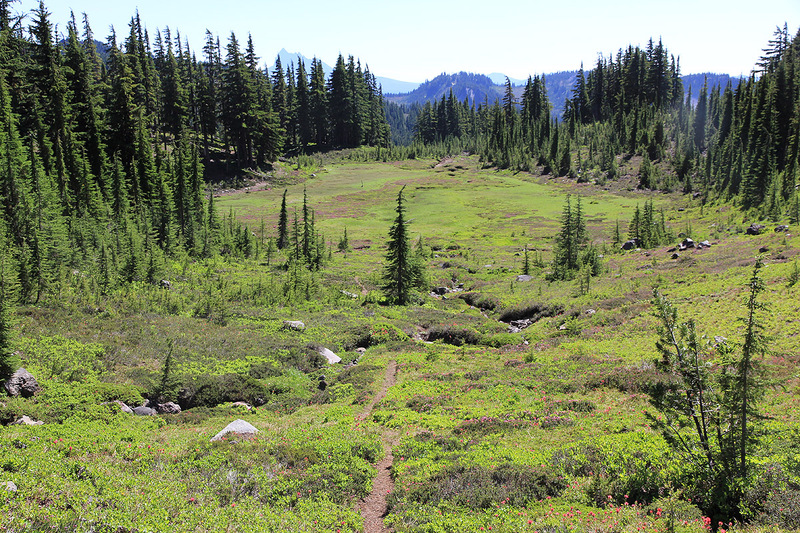 This trail climbs a bit, gains the main ridge before going off on the right (south) side, now more level then descending slightly before reaching a saddle where it connects with the Pacific Crest Trail (PCT). The distance to this point is about 2.9 kilometer (1.8 miles). Next, follow the PCT south (right) as it descends to Milk creek. Shortly after crossing Milk creek the PCT meets the trail coming up from Pamelia lake. This is another 2.9 kilometer of hiking. 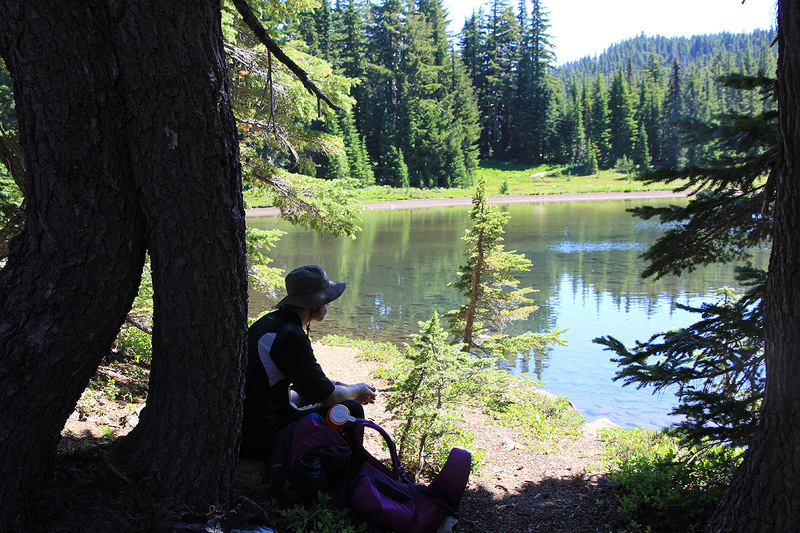 Continue along the PCT to Shale lake, location N44:38.294, W121:48.989, elevation about 1770 meter. 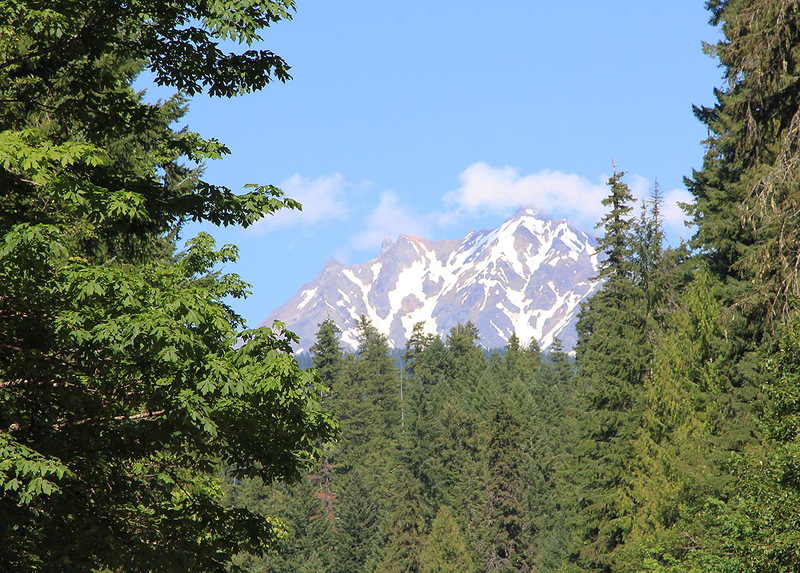 You have now hiked about 13 kilometer from the trailhead. There are several descriptions on the internet, but they all seem to get it wrong from here. As you get to the lake, follow its left (north) side to the east end, located next to a meadow. From here, find a pretty clear trail that heads north-east. This trail is cairned and follows the fairly obvious valley, generally in a north-east direction. You cross several nice alpine meadows, pay attention in order to pick up the trail at the opposite side. You should follow the valley all the way until it tops out at a small col next to point 7818 (2383m), marked on the topo-map. The last section of this trail goes as follows: After climbing a steeper slope, the trail turns you directly into an area with big boulders. There are a couple of cairns that show you the way across. 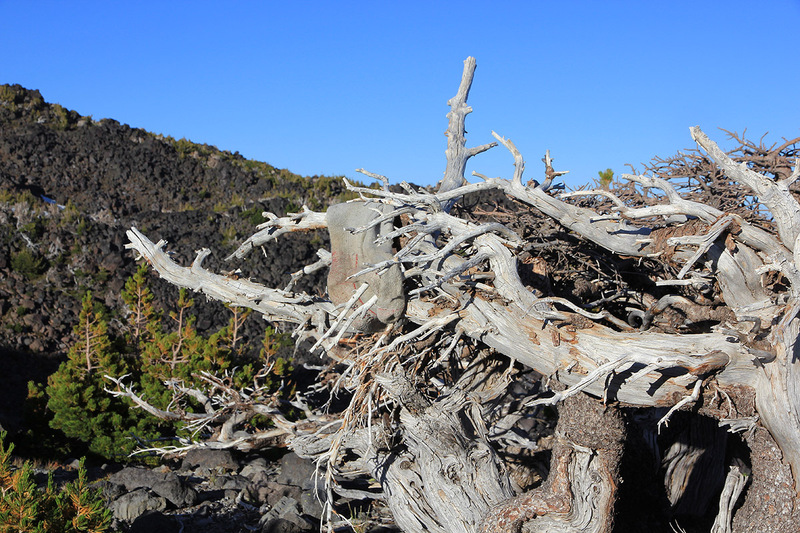 Immediately on the other side, turn left and hike parallel to the boulders. You may pick up some snow fields along the bottom of the valley. Continue up the last section, staying off the rocks by keeping right, but do not climb too high. The trail and some cairns will still be visible. Higher up, the trail is again easier to follow until it tops out in the small col. 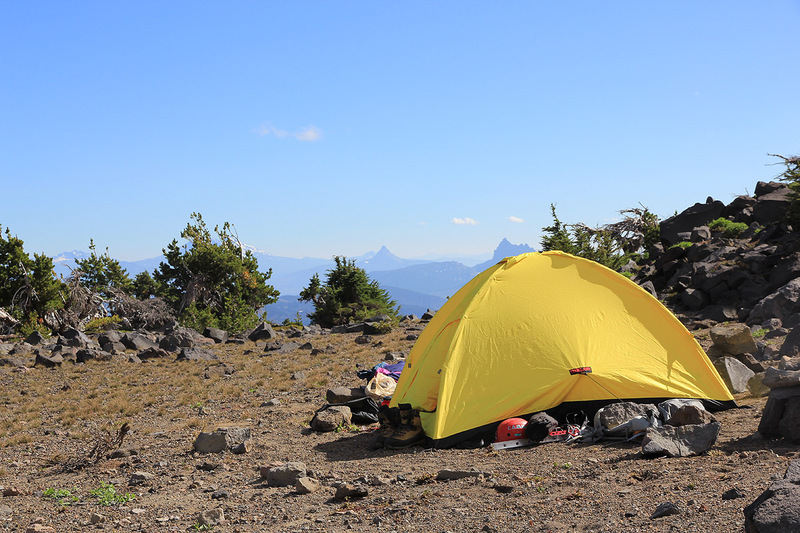 If you traverse around point 7818 to its east side you will find some excellents spots for camping. This location is N44:39.430, W121:48.048, elevation about 2340 meter. 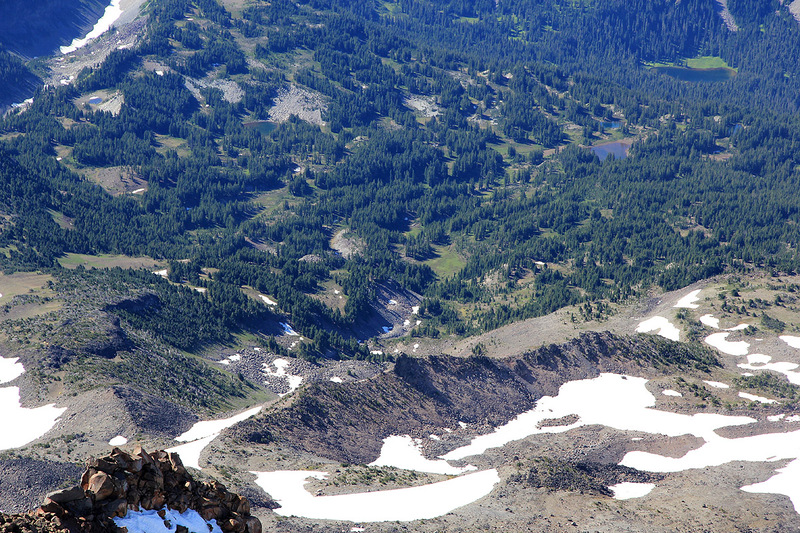 Please note that all route descriptions that refer to climbing the ridge near Goat Peak are flatly bad advice. 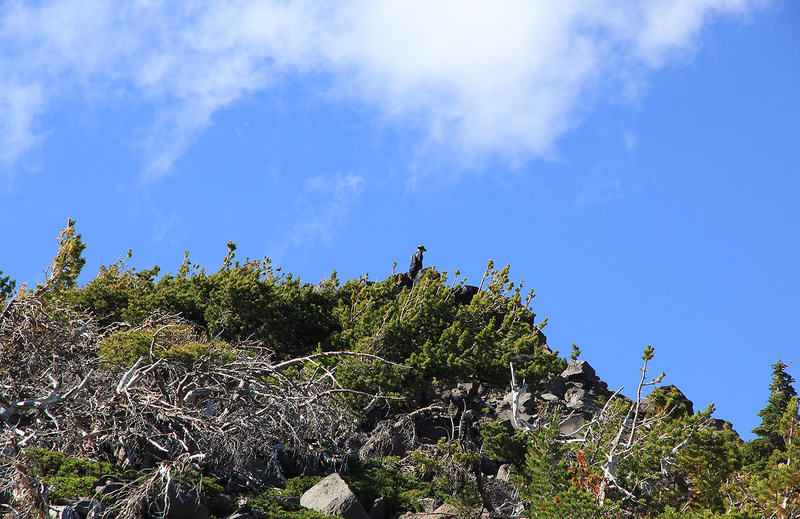 Climb: From the col noted above, continue up the (south) ridge towards the summit that you see towards the sky. Initially, possibly cross or circumvent some patches of snow, then follow one (there are many) climbers trail that zig-zag uphill. 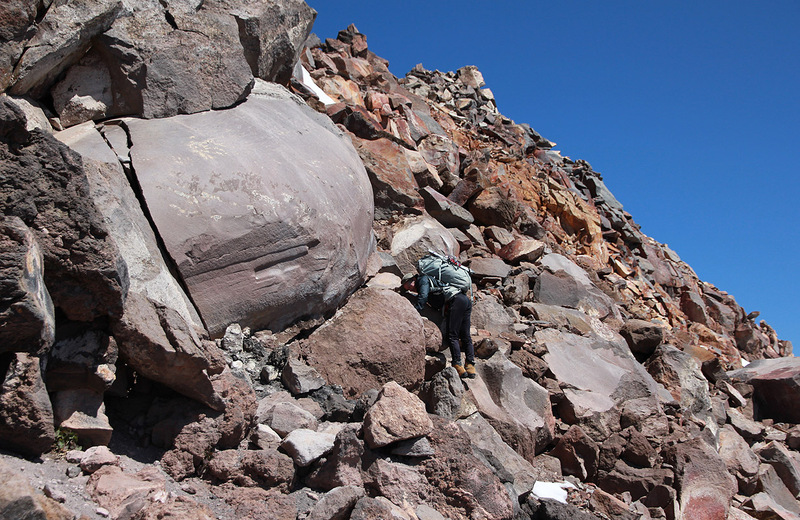 The footing is typically quite loose scree. We found it somewhat better to stay close to the ridge crest (bigger boulders), when going up, while the west side of the ridge was better when descending (more loose scree to slide on). Continue uphill as far as convenient, when you run into steeper rock, traverse right (east), but continue uphill when the terrain allows. Soon, you will see a route that leads all the way up to a distinct col at the horizon. This is not the Red saddle, but a smaller col before, it still seems to be the easiest and best route. 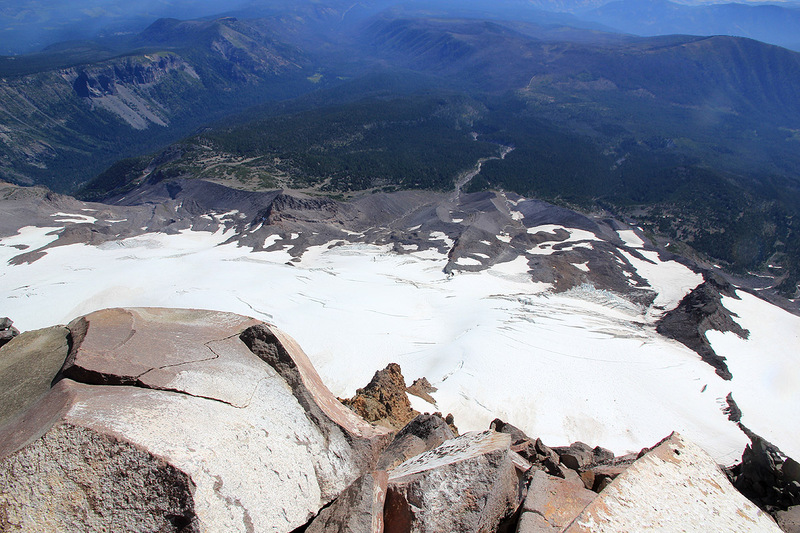 From this vantage point, you see what lies ahead, the Red saddle, the snow traverse as well as the twin peaks. From this saddle, it is an easy matter to scramble across to the Red saddle, more or less following the high ridge. 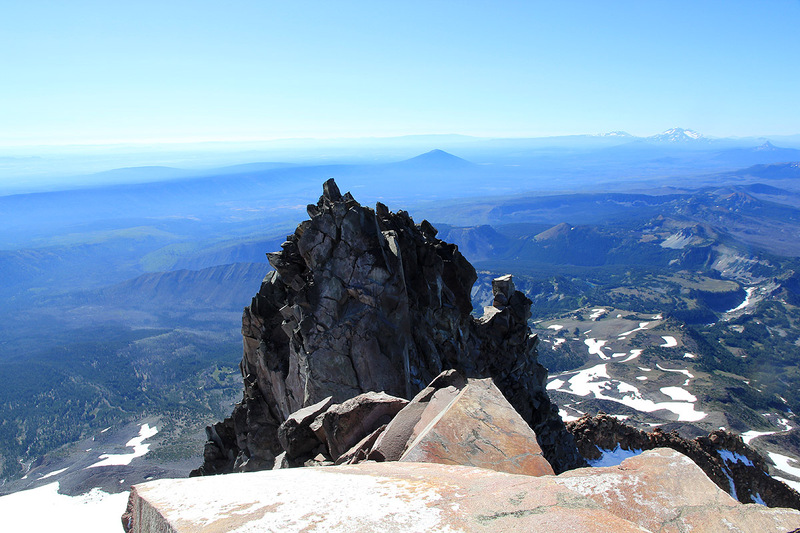 The Red saddle is a facinating spot to be, very high, yet with an imposing and stunning view of the south peak. You also see the traverse on the west side. Normally, with steep snow that may be very hard. The descriptions of this traverse seem to fall into two categories. 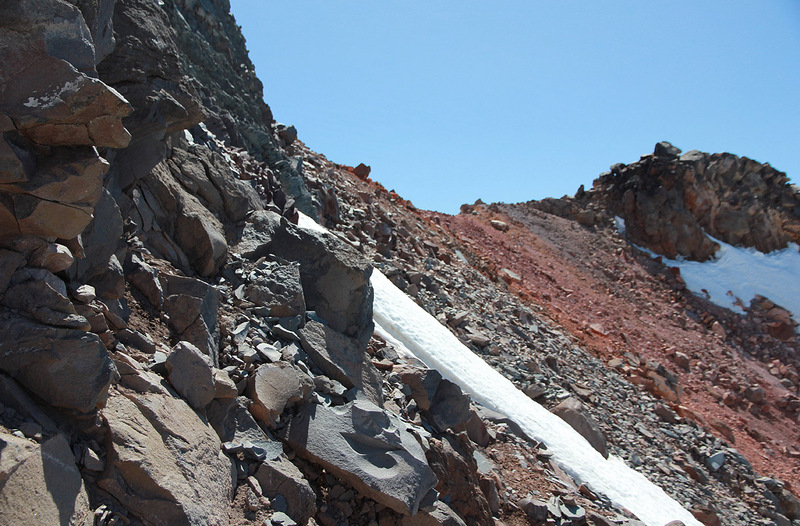 With relatively little snow, it seems like the best line may be a bit below the Red saddle and that the traverse is broken into two sections with a piece of rock, perhaps about one third of the way across. The angle of the snow slope seems a bit more gentle along this line. 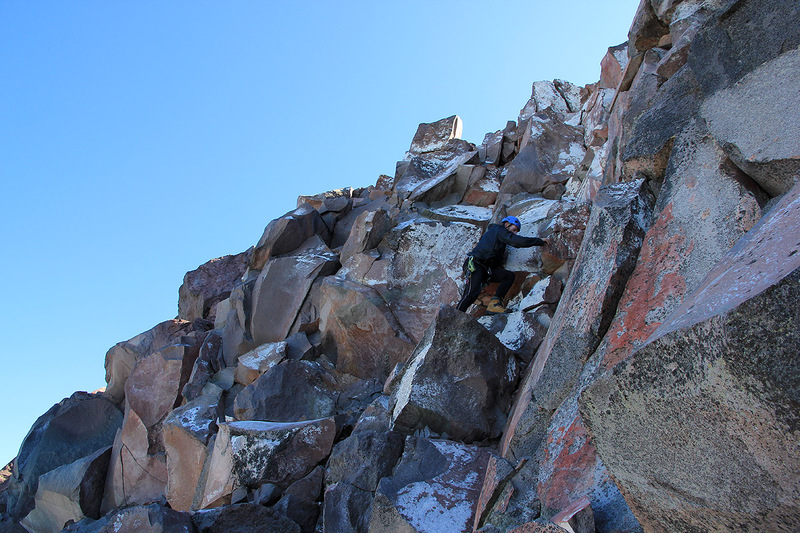 With more snow, perhaps a better line is to stay high, indeed make the route go close to the upper rock in such a way that one may use the rock for a couple of belay points. Finally, traverse to the ridge that forms a local horizon when viewed from the Red saddle. 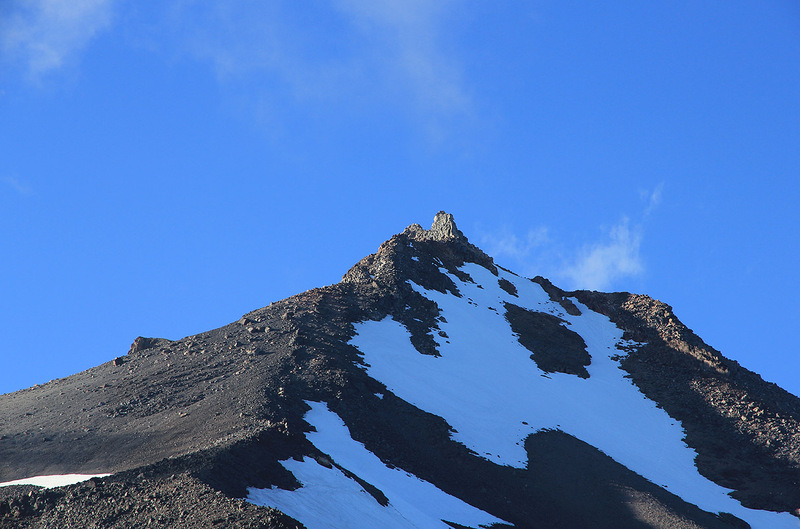 When we climbed the peak, the snow traverse extended beyond this ridge line for another 25 meter. You will need a 60 meter rope, a couple of snow pickets or deadmans (snow anchor), plus a few pieces to also place protection in the rock. 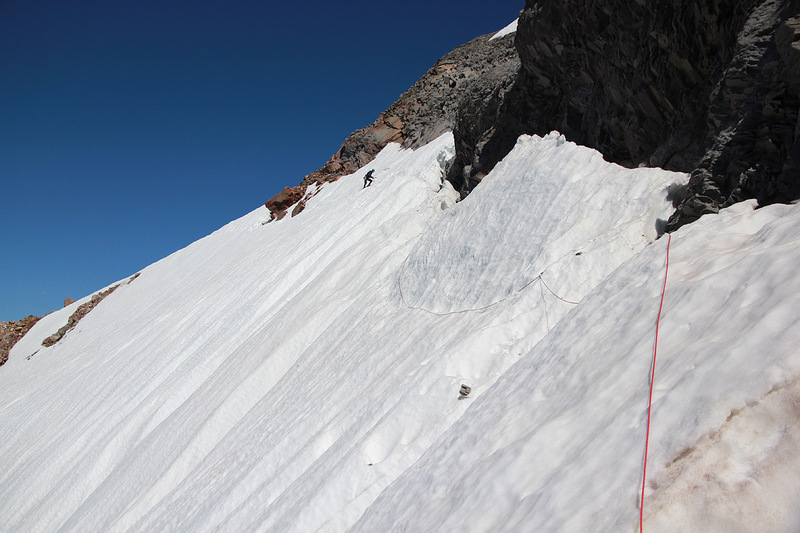 When we climbed, the traverse on snow was about 120 meter (two rope lengths). 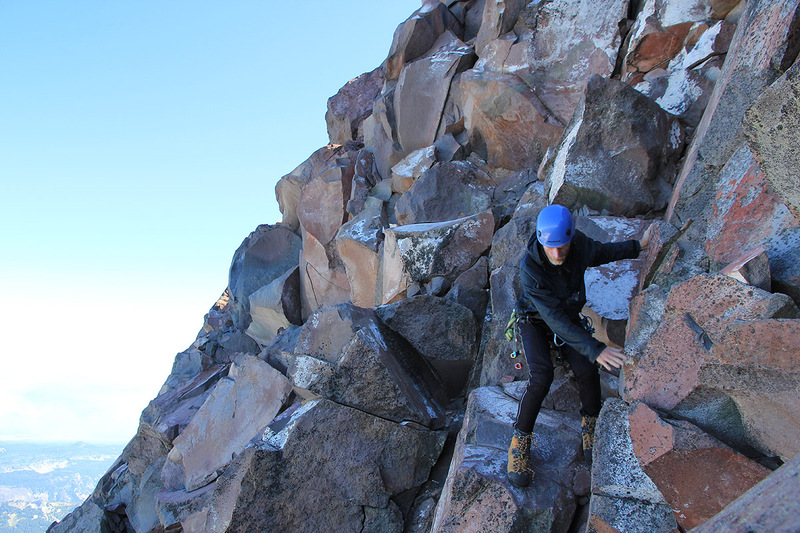 At the far side of the traverse, one readily sees the traces of previous climbers. The main track seems to originate from what would be the lower line across. We ended about as high on the rock as convenient, but one can continue to scramble north, then more east without loosing elevation. Continue around and climb gradually (pretty obvious where to go) until you end at steeps cliffs on the far north-east side. From here, one can climb upwards along a new line that traverses right. As you get higher, this line will lead you into a V-shaped rock face, a sort of (wide) open chimney, that narrows somewhat as you look higher. Climb up here, the rock becomes steeper as you go higher. Finally, you can reach the top and pull up. There are numerous good handholds as well as footholds if given time to look around and explore/test a little. This last section is (YDS) class 4. The summit is quite tiny with a highest point just on your right (when climbing as described). This rock has a number of slings around it, obviously many people absail off this summit. Further left is a slightly lower, but considerably larger slab of rock. There is a summit register in a solid metal box. We travelled from South Sister to the small city of Detroit where we found a comfortable motel room. Enjoying a nice meal as well as athmosphere at the local restaurant, we were both looking forward to the climb of Jefferson. Red tape:The next morning started with a solid dose of RED TAPE. We started early and drove towards the Pamelia trailhead. Shortly after the turnoff, we arrived at a sign informing that you needed a special permit in addition to the Forest Parking Pass, only available at the Detroit rangerstation. A maximum of 20 were issued on any day and it did not matter if one only intended to walk through the area (as we intended). We decided to honor this, despite the annoying need to drive all the way back to Detroit. In Detroit, we were told that one could make reservations by phone and that the trailhead was fully booked for several days to come. 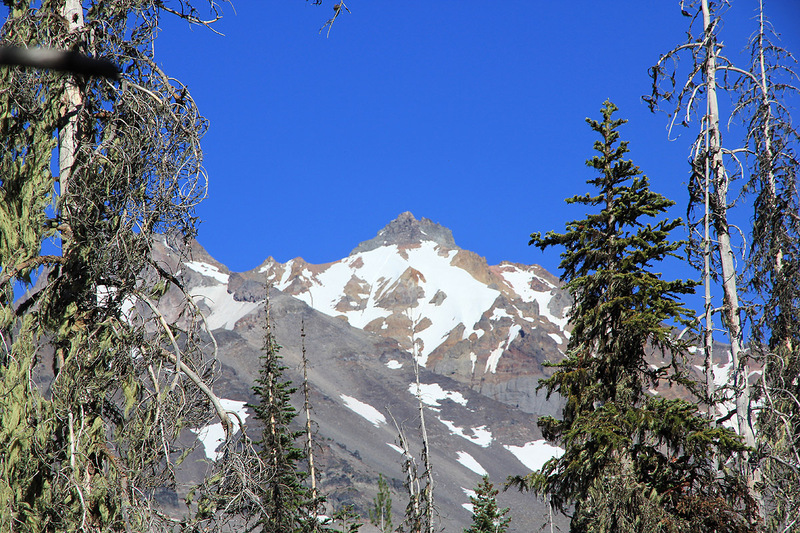 Bad news, however the (friendly) ranger told me that: "we are not known for making things easy", then he added: "you can hike from the Woodpecker trailhead, there are no restrictions there." Pretty inconsistent, and certainly nearly impossible to relate to for climbers like Rob and myself, coming directly from Europe. Approach hike: We started out again, this time towards Woodpecker trail. After parking and a bit of organizing, we left the trailhead by 0915. The trail was not bad, you start higher, but then you loose a bit of elevation when descending to Milk creek, before merging with the trail that comes from Pamelia lake. The PCT is generally a very nice and easy trail. No steep grades, very gentle all the way. 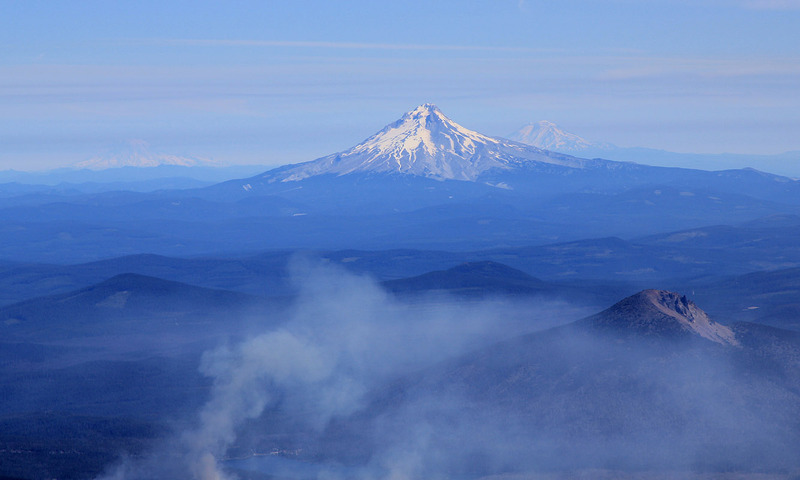 Mount Jefferson could be seen between the trees on a few occasions. We met a young couple that had been out on the trail for more than 100 days (starting at the Mexican border), they estimated another 25 days or so before arriving at the Canadian border. Later, at Shale lake, (at 1245) we talked with a man from New Zealand, he had a bigger pack, also headed from Mexico to Canada along the PCT. From here We took a 30 minute break here, by then the local mosquitos were hitting us with an intensity that encouraged a rather quick departure. We did not know about the trail, thus walked a bit cross country before hitting the trail. 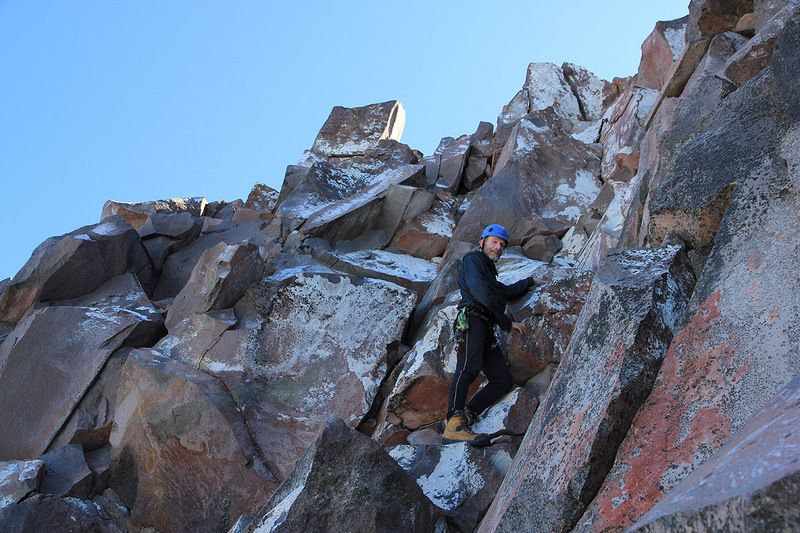 As we crossed the boulders, we failed to notice that the trail continued and started an ascending traverse. Higher up, this brought us into quite some trouble due to dense vegetation growing on steep, loose slopes. Getting onto the ridge, a short walk got us to a near perfect camp site, arriving at 1515, we were quite happy with our location and discussed the details of the mountain that was visible from camp. Drying socks in the last sunshine, cooking a good Drytech (Real) dinner, then a good night at a very nice camp. Climb: Breakfast (hot), then on the way by 0615. A pretty long and somewhat tedious climb up the south ridge. We quickly got higher and the morning view south to the Sisters got only better and better. Most memorable was the long and sharp shaddow that Jefferson projected just after sunrise. Not only on the land to the west, the shaddow was clearly visible in the atmosphere, perhaps reflecting off dust particles? We reached the Red saddle by 0830, what a place! 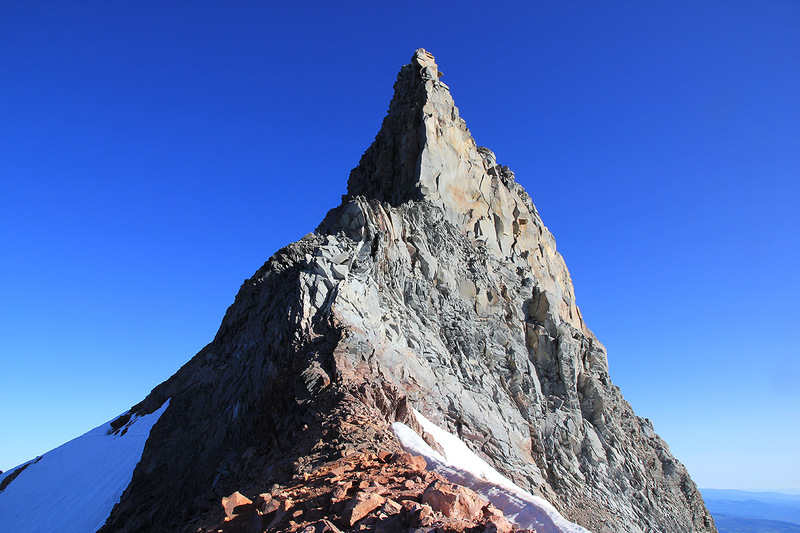 The Jefferson (south) peak, rising directly above us, it did seem to say: "Not this way". The snow traverse on the west side, appearently more snow than normal. Completely in the shaddow, a touch revealed that it was very hard, a boot would hardly leave any marks. The route seemed pretty clear, stay high, find protection at least a couple of places in the rock, then traverse high to the ridge at the horizon. Beyond there, more snow or rock, impossible to know. Rob attached himself to the rock and started giving out rope as I moved out on the snow. We had agreed that I would run out the full 60 meter, then he would follow until I made it across and could pull in rope as Rob would complete the last 60 meter. It turned out that steepish snow continued about 30 meter beyond the distinct ridge. Things went according to plan and we unroped on the very first rocks. We left the rope behind, having read that the summit pitch should be ok without. The route and what we think is the best line, was easy to follow and soon we were in the last, steep section. The climbing is certainly exposed here, quite steep, but with fairly large holds. 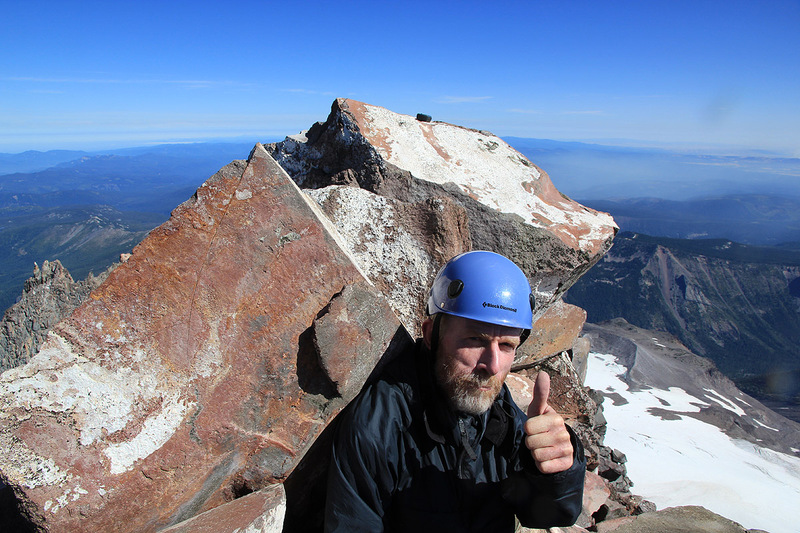 I was quite happy when pulling up onto the tiny summit, with Rob following closely behind. A great summit on a very nice day! 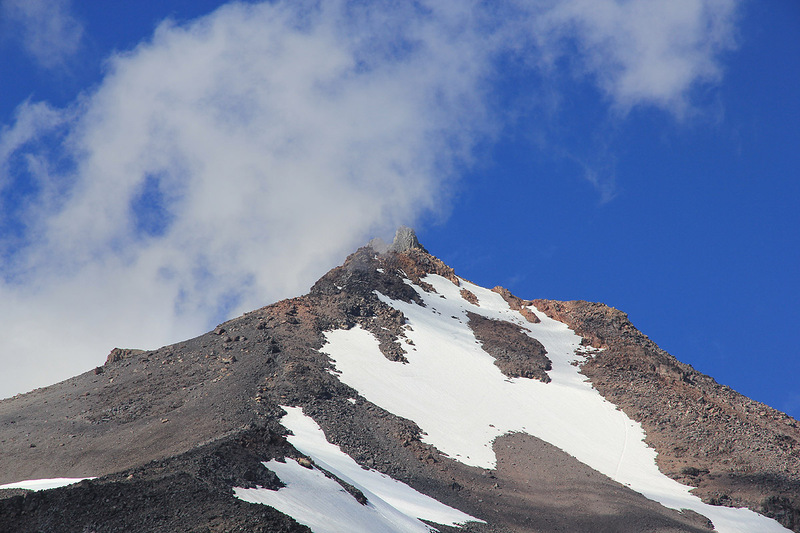 We noticed the half dozen slings around the very summit, obviously many people abseil from here (the view is west). Rob entered a note in the summit register, speculating if bringing the rope up indeed had been a good idea? Anyway, we truely enjoyed a spectacular position and the views around and back down along the slopes and glaciers. 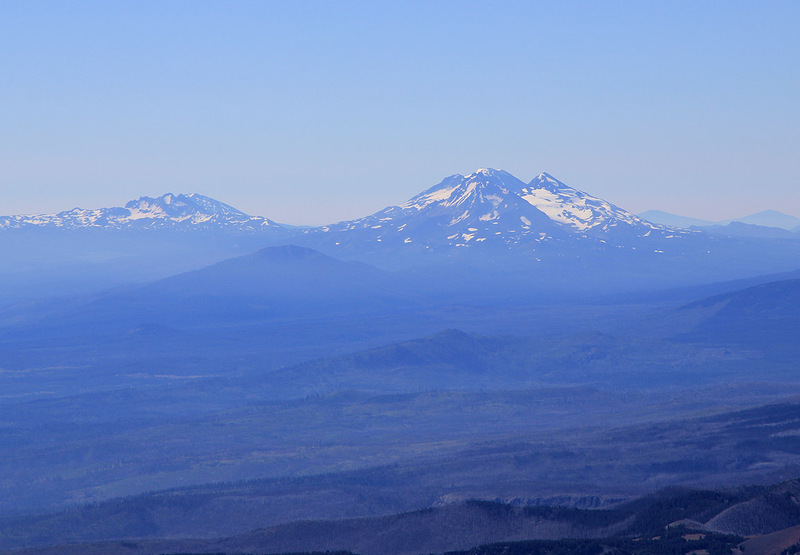 The view north features Rainier (weak), Mount Hood and Mount Adams, high and isolated volcanos. The South peak was near, but the route there is not trivial. 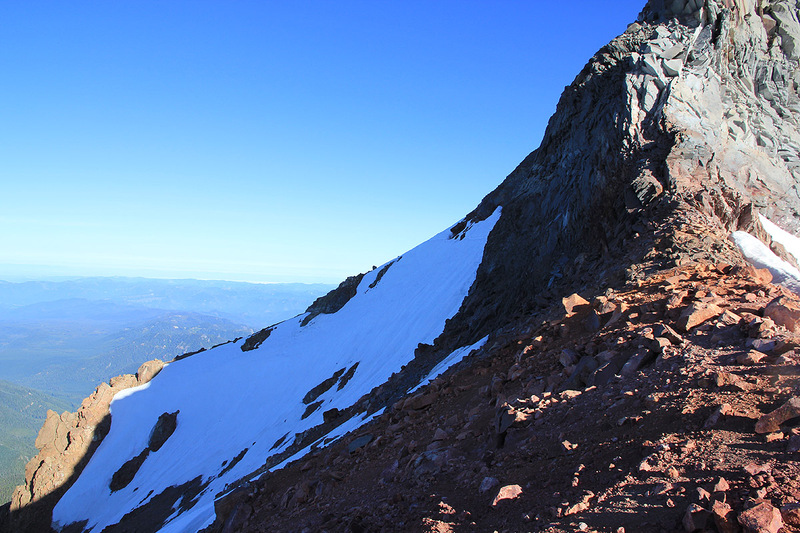 We had summited at 1015, the traverse had taken more time than what it felt like. As soon as you transfer into "climbing mode", the time really runs fast. We started descending at 1030, I was happy with Rob going first, he could then give me hints about where I should place my feet in the upper part of the chimney. Returning back to the Red saddle went smoothly. We traversed along the same line and I noticed that the sun already had made a thin layer of softer snow on top. No advantage, rather a need to proceed with great caution. We were back in the Red saddle at 1200, noon. The weather was still great and the terrain, now with different light, equally impressive. We descended back to our camp by 1330 and took a well deserved half hour break while breaking camp. Leaving at 1400, we passed Shale lake at 1515 and reached the car by 1830 after what seemed like quite a long day. We drove back to Detroit, secured the last motel room available (Friday evening), then across the street to a nice dinner at our local restaurant. 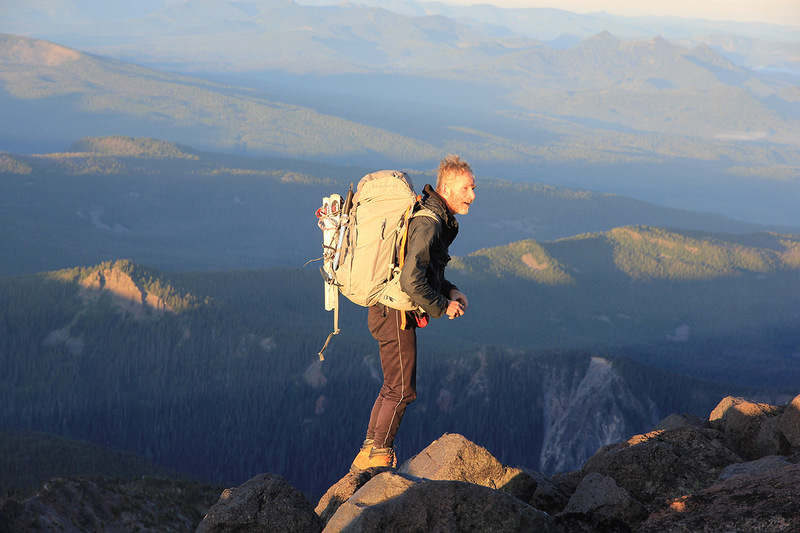 We agreed that the best schedule would be to drive back to our Seattle HQ, and meet up with Greg, our climbing friend that was supposed to climb Mount Stuart with us more than a week ago. On Sunday, we would then set out for Olympus, our next goal. 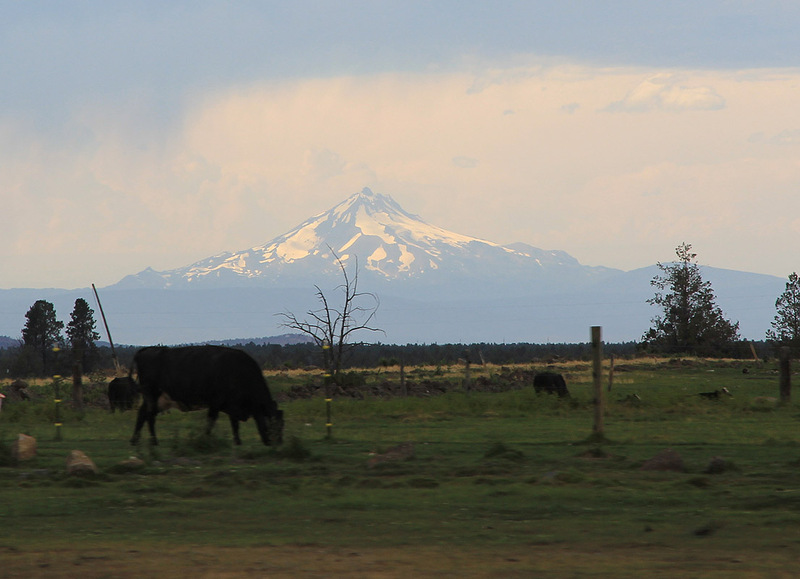 Mount Jefferson, as seen from the highway. 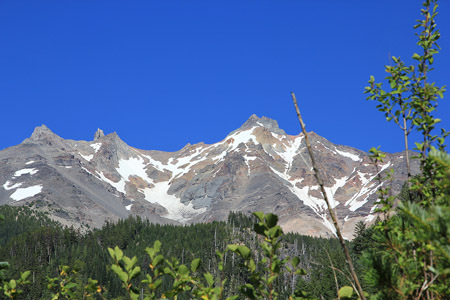 Mount Jefferson, as seen from the trail. 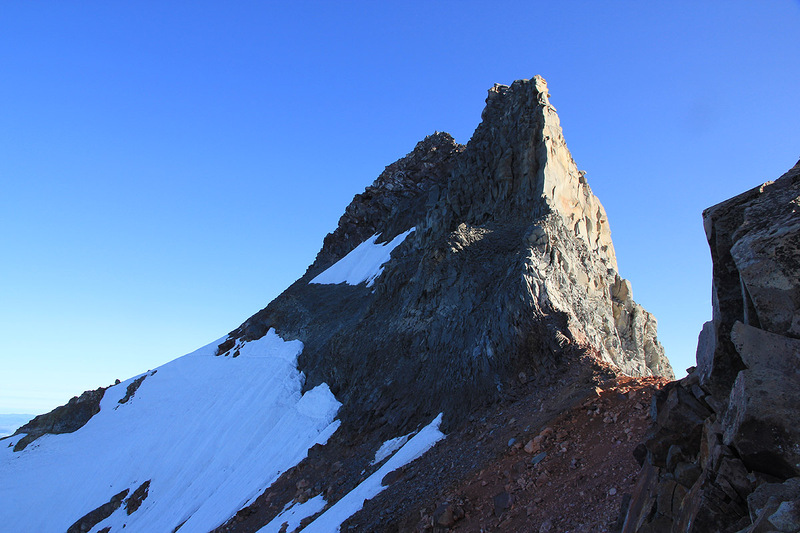 From left to right: North summit, South summit, Red saddle. 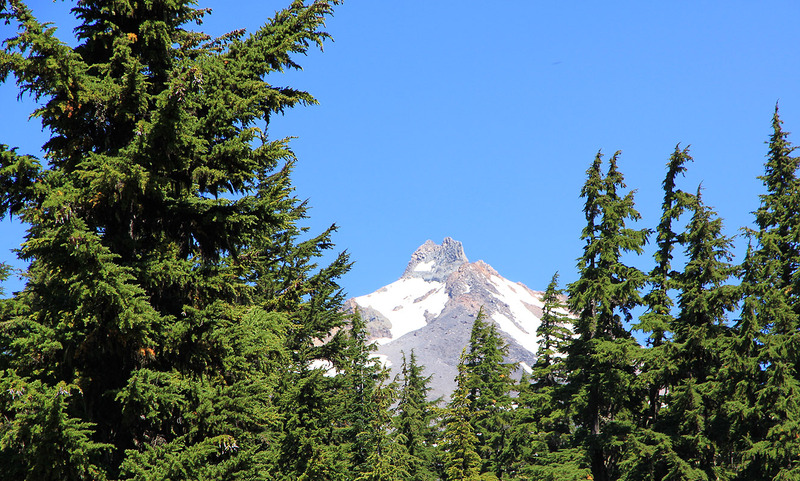 Mount Jefferson, as seen from near the junction between the Woodpecker trail and the PCT. 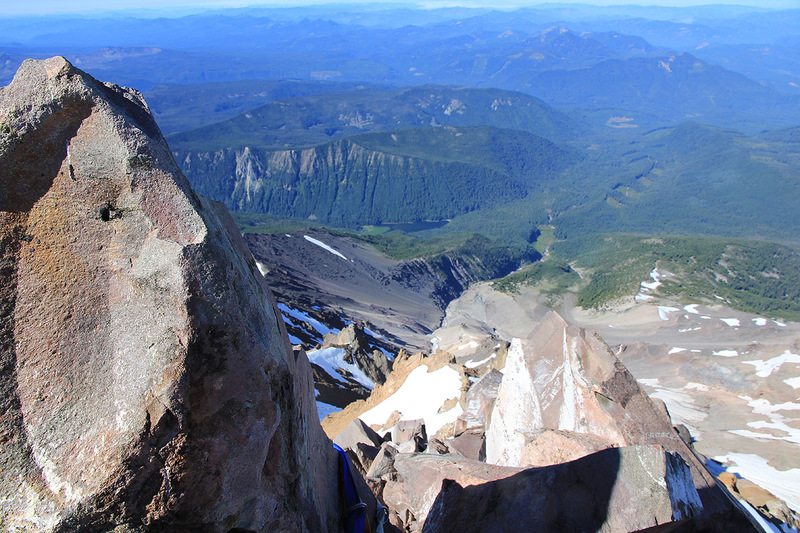 The final climb is up near the lighter colored rock just below the summit. Mount Jefferson, as seen from near Milk creek. The approach route, from Shale lake, follow the clear valley across meadows, then further passing smaller patches of snow, finally up to near the small, circular snow spot near point 7818 in the lower left corner. Our tent (small yellow dot) can be seen further left, near a larger snow field. 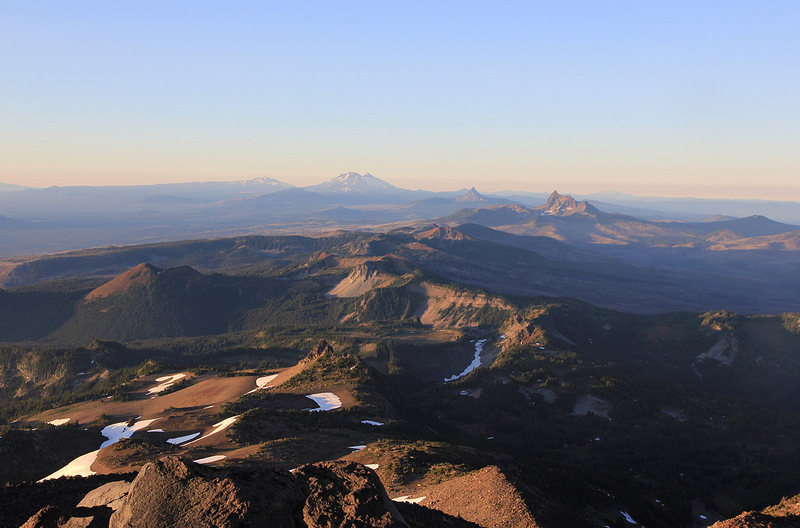 The Sisters, as seen from the summit.